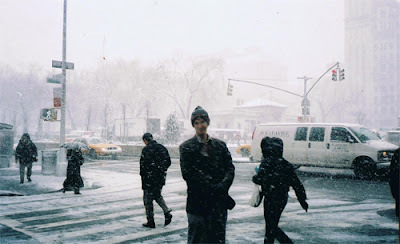 New York – What Can I Say? Yesterday afternoon I caught the Amtrack up from Philly. I planned on working but it was freezing outside and warm as toast inside. I think I only heard three bars of clickety clack music and I was asleep. I woke just as we arrived at Penn Station. I had an address for the hotel which I saw was in 7th Avenue. I counted the blocks and figured there was only a short distance to travel. I had a case for each hand, was wearing only a suit and business shirt and in the warmth bliss of the station figured this would be a quick and bracing trip. After a block I can confirm the bracing, but not the quick. Stupidly I walked past a man selling mittens of a dollar. Not one man actually. About five. By the time I had cleared the station they were well gone. So on I pushed. Block after block after block. Across Broadway, up 7th Ave, through Times Square and on and on. Slower and slower. More and more braced – stiff. I did not realise just how stiff until I arrived at the hotel reception and was unable to speak, unable to put my cases down and appearing like a mute before the rosy faced receptionist. She seemed to know what was going on and pointed me at a corner near a heater, beside which which I thawed, eventually released my hands and then attempted to sign in again. But even though I could mumble (the jaw needed massaging to help it along) I could still not hold a pen. She accepted a scrawl.